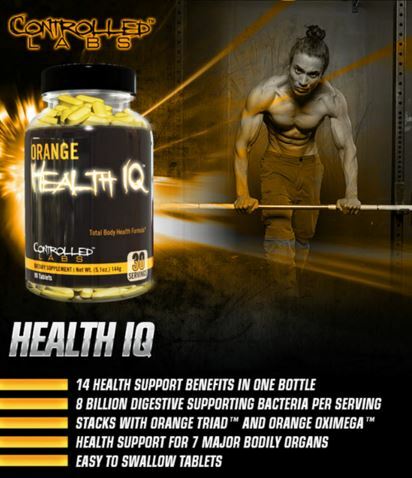 Controlled Labs Orange Health IQ is the smart way to take care of your body because this product is intended to help support cardio, digestion, liver, inflammation, prostate, sleep, hair, skin, free radicals, vision, detoxification, breath, kidneys and adrenals. Orange Health IQ also helps to aid in 7 major bodily organs and helps with digestive supporting bacteria to help keep you healthy overall! INGREDIENTS:Maltodextrin, Stearic Acid, Microcrystalline Cellulose, Dicalcium Phosphate, Croscarmellose, Sodium, Magnesium Stearate, Silicon Dioxide, Pharmaceutical Glaze (Shellac, Povidone) Contains Milk. Initial (first serving) Directions: Start by taking 1 tablet to assess your individual tolerance. If you experience any unusual occurrence, stop and consult your doctor. Directions for Regular Use: Take 3 tablets per day with a meal. Consume at least 8 glasses of water per day. Warnings: Keep this supplement in a cool, dark and dry location like a kitchen cabinet. Before ingesting this product you should consult your doctor if you are not aware of your current health status or if you have any medical condition including, but not limited to: diabetes, high or low blood pressure, cardiac arrhythmias, stroke; diseases of the heart, kidneys, liver or thyroid gland; anxiety, history of seizures, depression, any psychiatric ailment, pernicious anemia or other blood disorders, prostate enlargement. This product is intended for adults 18-50 years of age only. WARNING: This product contains chemicals known to the State of California to cause cancer, or birth defects or other reproductive harm. Do not take this product if you are pregnant or nursing. Do not consume with less than the recommended amount of water or if you are prone to dehydration or are subjected to extremely hot temperatures. Do not take this product with any drugs without permission from your prescribing doctor.